The Alleson Girl's Softball Short is made of 100% eXtreme microfiber Cationic colorfast polyester with moisture management fibers. This solid short features two rows of self-material with contrast color piping down the sides and 1" apart to match jersey neck. It also features one row of piping around the bottom of leg openings with v-notch sides, 1 1/2" covered elastic waistband with inside drawcord, and gaduated seams. 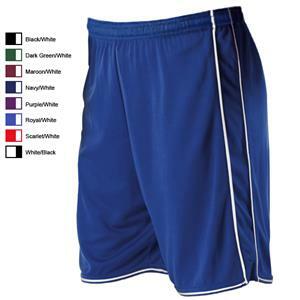 This short is made of 100% eXtreme microfiber Cationic colorfast polyester with moisture management fibers. This solid short features two rows of self-material with contrast color piping down the sides and 1" apart to match jersey neck. It also features one row of piping around the bottom of leg openings with v-notch sides, 1 1/2" covered elastic waistband with inside drawcord, and gaduated seams. White shorts are double ply. WAIST 21" - 23" 24" - 26" 27" - 29"